A few meters from the Herbs Square you can reach Dante Square with the overlooking Palace of the Virgilian Academy and its beautiful theatre. 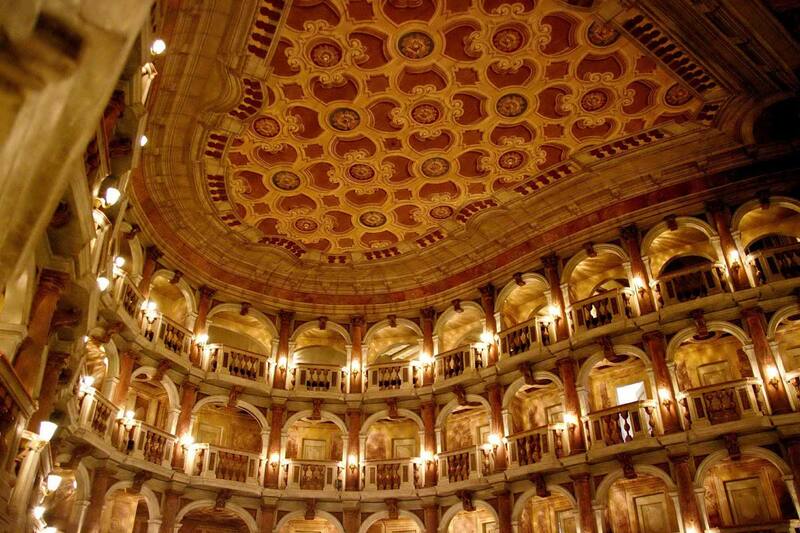 The Bibiena Theatre or Scientific Theatre because it was meant for the Royal Academy of Sciences and Arts is the masterpiece of Antonio Galli Bibiena (1769). The theatre has got four lines of boxes, a bell-shaped plan and fixed scene. The inside of the boxes are gently monochrome-decorated with classical subjects. On January the 16th 1770, just a few days after the opening, Wolfgang Amadeus Mozart at the age of 13 held an extraordinary concert that revealed his talent to the world. His father Leopold after this enormous success wrote a letter to his wife and in describing the theatre said “In my life I have never seen anything so beautiful”. Brunella Malaguti responsabile del CENTRO GUIDE I GONZAGA, storica dell'arte e guida turistica abilitata e certificata, segue con passione e professionalità imprese, aziende, agenzie di viaggio, gruppi singoli e scuole insieme ad uno splendido staff che fa del CENTRO GUIDE I GONZAGA un punto di riferimento sicuro da oltre 25 anni. Chiamateci per un preventivo gratuito o un consiglio su come svolgere la vostra visita a Mantova. Guideturistichemantova.it utilizza i cookie: continuando la navigazione se ne acconsente l'utilizzo Leggi di più.